We at MDG would never find it unusual if, upon entering a new friend's home, the first act would be to beeline it to the bookcase. Is there anything more representative to someone's personality? Will we find shelf upon shelf of Stephen King, or will there be well-worn copies of Anna Karenina, Pride and Prejudice, and The Odyssey? Are these shelves of books alphabetized, color-coded, by genre, or so stuffed to the brim that choosing one particularly poorly-placed tome unleashes an avalanche of titles across the worn rug? What we're seeing more and more of is the transition of a bookcase from being merely a means of storage into a space of utility and style, personality and purpose. We're using our books as a backdrop to display knickknacks and collectibles, and vice versa. Among the stacks of food memoirs, the corner of Calvin and Hobbes, the shrine to Harry Potter, and the odd guilty pleasure, we're finding the ceramic dog that has been passed down for generations, a framed photo from prom a million years ago, and trinkets from travels across the globe. 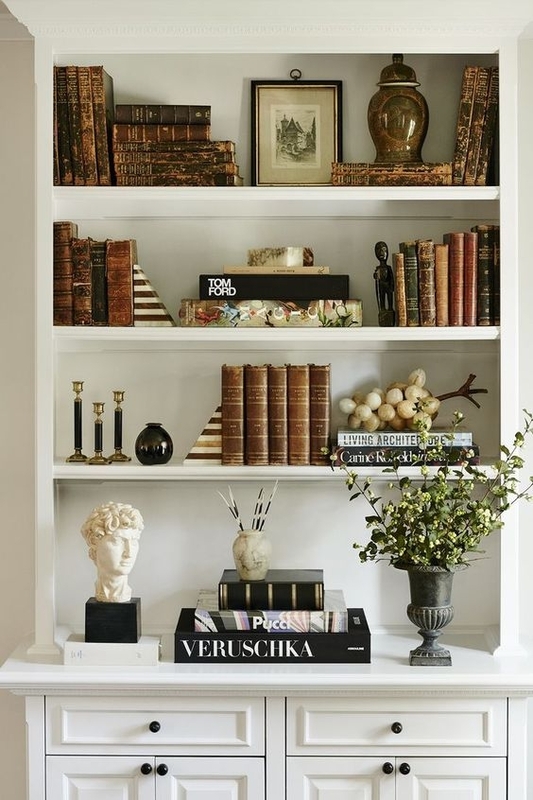 Below, you'll find some of our favorite additions and accessories to a brag-worthy bookcase. Illuminate a darker corner bookcase with a quirky sculptural lamp or candle that smells appropriately like a library. Look to the golden age of libraries (is there a golden age of libraries? I'm picturing Beast's library when he throws open the window curtains for Belle) for inspiration and incorporate beautiful coordinating sets of bookends or vintage clocks. Keep your shelves airy and from looking too cluttered by inluding tall vases and bursts of greenery with air plants. Let your personality shine with family heirlooms, keepsakes, photos, gifts, and travel souvenirs that you can change out with the seasons. Add dimension and layers by hanging favorite artwork or mirrors on top of shelves, because who needs to stay in the lines? Squirrel-eaten Jack-o-lanterns are being thrown out, baseball season is over, and the the first Christmas commercials of the year are outraging all the people screaming, "Let's not forget about Thanksgiving!" Please, an entire day devoted to overeating carbs? We ain't forgetting about Thanksgiving. As we get ready for shorter days and snowy nights, we are seeking out the coziest spot in our homes. We want a snuggly sofa. We want to curl up on that couch with our families, our cats, our books, our wine, whatever, and never leave. We are piling our sofas with blankets and pillows and sinking in for a Netflix binge while the frost begins to form on our windshields outside. 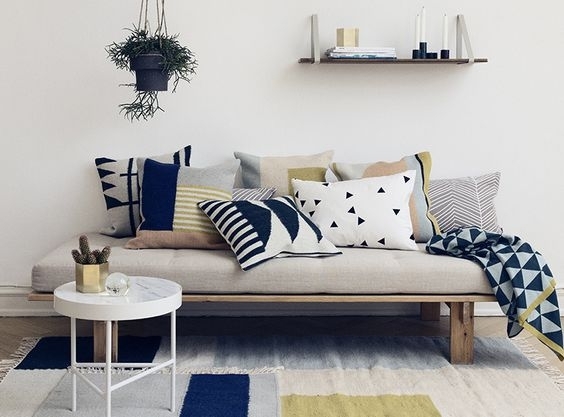 Pick your couch, your pillows, your blankets, and your little extras and make your cozy spot your favorite spot in the house.